Can today really be September 1? Stonebridge is deep in the heart of the harvest this week, with more food in the fields than ever before. We’ve had perfect growing weather this season, moist and warm like a garden in a greenhouse. Even the apples are heavy this year; we’ll start pressing for cider in a couple weeks. With eight Saturdays left for our CSA shares, we’ll be picking every day until the first frost slows us down a bit. Until then, here’s a few pictures of many bushels’ worth coming in from the fields. Happy Harvest, everyone! 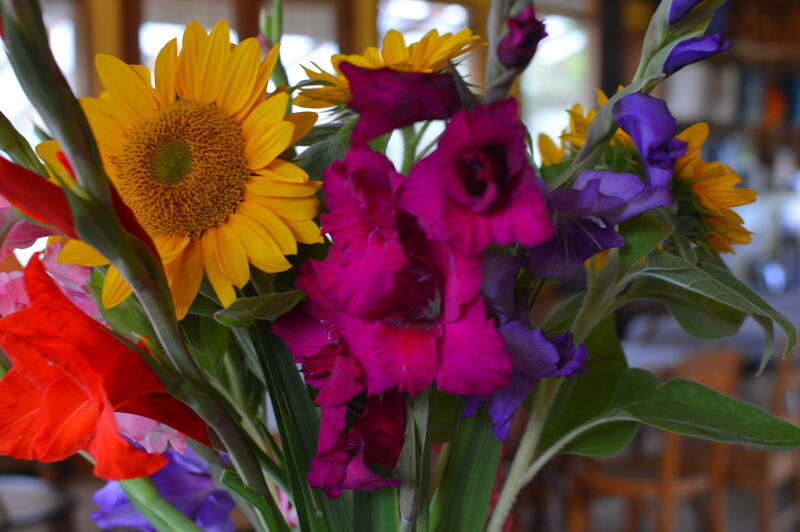 We’ve had to net gladiolas and sunflowers from the deer this year but it’s worth it to get a bouquet like this. John picking heirloom tomatoes from the tomato field, also netted around the perimeter for deer. Heirloom tomatoes in the barn. 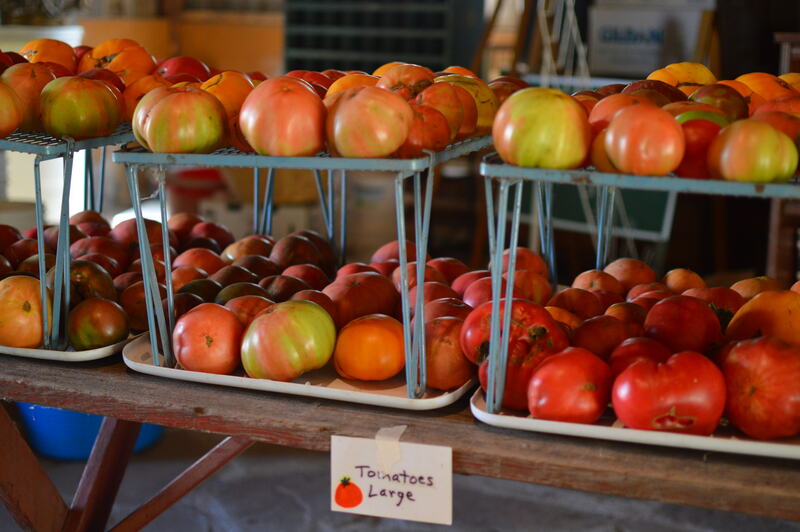 We grow red and gold Brandywine, Mennonite, and Cherokee Purple tomatoes and save seed from the best of each for the next season. Beautiful Juliet cluster tomatoes in the bluehouse. We dehydrate these for winter meals. 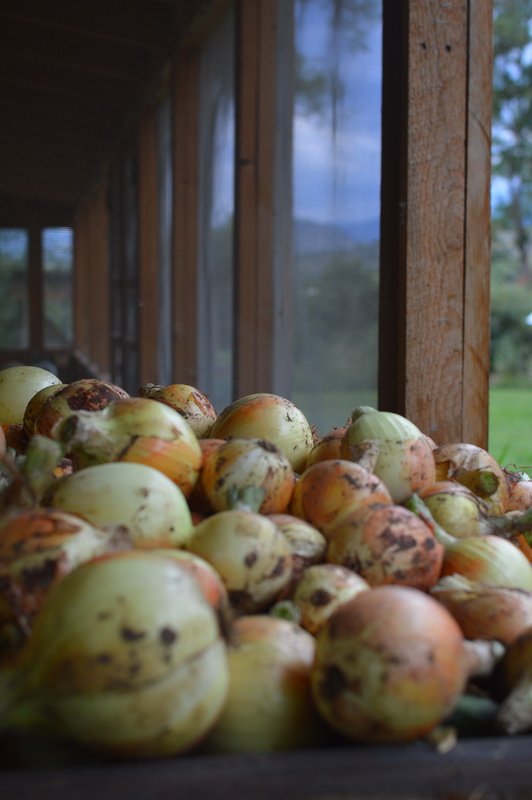 Onions on the drying rack with the Rockies in the background. 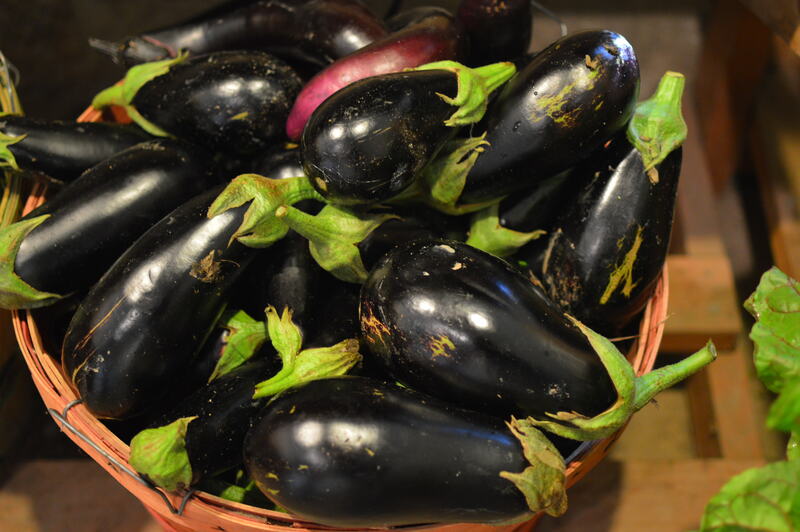 Gorgeous eggplant–we love our new globe variety, Diamond, as well as Nadia, Traviatta, and Galene. 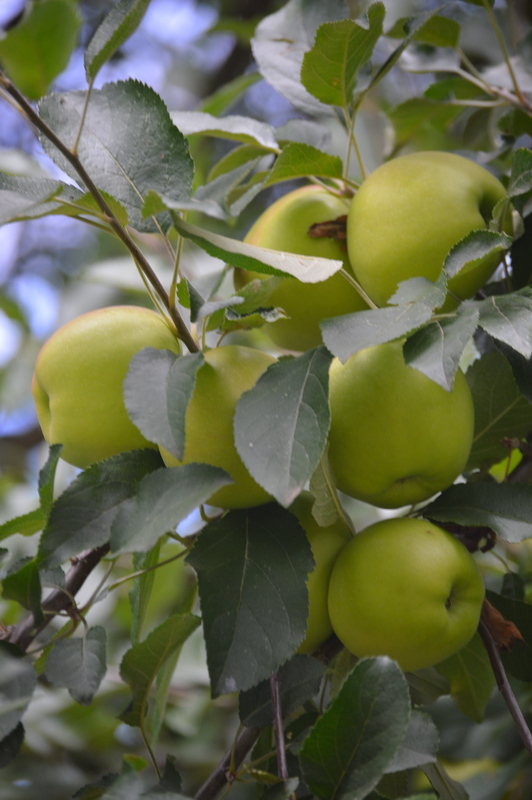 We’ve been thinning these apples and will harvest after a little frost. No worms or coddling moths this season! Can’t wait to press cider. 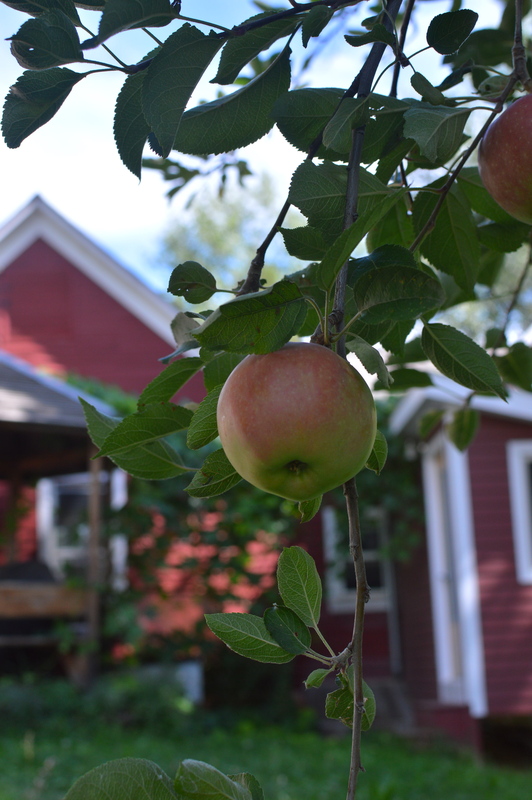 An apple from the old orchard by the farmhouse. 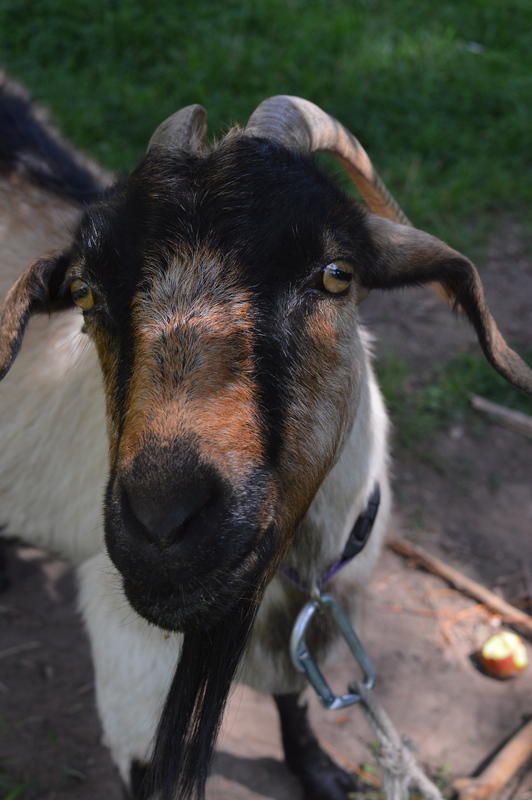 Our 13-year-old Kashmir goat Cinnamon. We lost 14-year-old Slippy this season. Cinnamon’s a little lonely but she’s adapting to being top goat after all these years. We finished the farm season in the barn last Saturday giving Thanksgiving shares to the dozen members who signed up for them: carrots, rutabagas, parsnips, winter radishes, leeks, onions, garlic, shallots, rosemary & parsley, a butternut squash and a pie pumpkin, plus a bag of greens just because we still had them under row cover in the garden. The parsnips were two-feet long, making digging them without breaking a challenge. I wish I had a picture of John and Peter popping parsnips out of the ground with a baling twine lasso and the post puller, sort of like extracting a tooth—or giving birth; we weren’t sure which image seemed more apt. Now all that remains in the barn are the onions and squash for delivery to community Thanksgiving boxes this week and extra roots and onions in the insulated cool room for our winter meals. It feels good to be done in the barn, knowing that all the vegetables are awaiting wintry meals and holiday celebrations. As we talked with friends in the barn on Saturday, rain started to fall, turning to snow throughout the afternoon. The day before, the remaining fall foliage still blazed brilliantly against the foothills, but this snow brought down the leaves and now the trees are bare. Funny how much colder the world feels without that autumn gold. We’ve got the woodstove going in the house and I pulled the first heavy sweater out of my closet yesterday. Now begins a quieter time at the farm. Our winter plans include replacing, with the help of the utility company, a decades-old power pole (who knew we actually owned that thing, but on a farm, we do) and renovating the granary we trucked down the highway last spring. And we’ll be writing, working on projects already begun, taking them a step further into the world. Now that the clocks have fallen back, the evenings feel longer, or at least longer to fill. John made the first round of root soup with dumplings on Saturday night and we’ll soon get the pressure cooker going with the dry beans we finished shelling last week. With greens from the bluehouse, squashes stored in the closet, canned goods in the pantry, roots from the barn, and tomatoes in the freezer, we’ll eat well all winter. Now, as my friend Barb reminded me, my knitting needles are calling. Knitters know how hard it is to throw away those little bits and leftover skeins of yarn. I’m just about done with an ipad sweater from one such skein, a bulky Icelandic yarn, now cabled to “cozy” my ipad. I made one last year for my laptop and get lots of appreciative comments when I take it for service to the Apple store. That’s what leftover bits of time are good for too, the hour before bed in the dark evening when I have to unplug or the half hour while the dinner cooks and I need to get off my feet. A little bit of quiet, a slightly slower pace, and less driving anywhere unless we really have to go. We’re looking forward to these days of winter work and rest while the world keeps spinning around us. I’m a supporter of a dedicated non-profit organization called Women Thrive Worldwide that advocates for women’s economic opportunities and rights internationally. I met WTW’s founder, Ritu Sharmu, years ago in Denver at a global women’s rights conference and was impressed by her commitment to increasing our government’s support for policies and budget priorities that help women around the world lift themselves out of poverty. In 2008, 2009, and 2010, Ritu lived on $1 a day in Burkina Faso, Guatemala, and Nicaragua to better understand the way many people in the world survive today. WTW also raises awareness of how global crises like famine, war, recession, and natural disasters place a disproportionate burden on women through sexual violence, food insecurity, increased family responsibilities, and social barriers. Right now, Women Thrive Worldwide is asking for meal ideas, stories, and recipes as part of their Help Women Feed the World campaign. To recognize the fact that 2.5 billion people in the world live on less than $2 a day, WTW is asking people to cook just one meal for that amount. By growing our own food at Stonebridge, we eat pretty economically, but $2 a meal is still a challenge. Tonight I’ve made stuffed peppers for two people that, I hope, would not cost more than $2 if you either grew the peppers yourself or got them at a farmer’s market or grocery store. I submitted our stuffed pepper recipe and was selected for the Women Feed the World Campaign. Click here to see my recipe and learn more about this fabulous campaign, including $2/meal recipes from around the world. 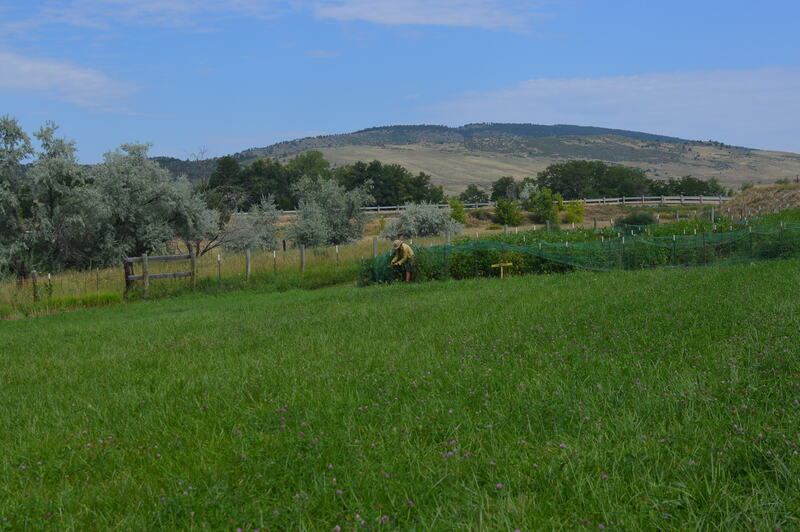 My partner and I have an organic community-supported agricultural farm (CSA) in Colorado. From August through October, we harvest lots of different kinds of peppers and love to make stuffed peppers in a variety of ways. Before the first hard frost comes to the garden, we pick all the peppers and share them with our members. If you don’t grow your own or are a member of a CSA, peppers are also an economical choice at farmer’s markets or grocery stores. The great gift of peppers is that they’re so easy to freeze: you don’t have to do anything but core out the stem and seed pod, chop or slice them, or leave them whole to freeze for stuffing later. When you’re ready to make stuffed peppers, pull them out of the freezer, stuff, and bake—no need to thaw first. Our stuffings always include a mixture of grain (bulgar, quinoa, rice), nuts or seeds (walnuts, sunflower, sesame), grated or finely diced veggies (carrot, more peppers, broccoli, kale, spinach, summer squash), and some grated or crumbled cheese (feta, Monterey jack, or parmesan), although cheese is optional if it’s over your $2 budget or for a vegan diet. For extra protein, add cooked lentils or small beans. Buying grains and legumes in bulk saves money; I always make a double batch so I have enough for a couple of meals. Bake in a low-sided, oiled roasting or cake pan at 395 for 45 minutes to an hour, depending on the thickness of the pepper. Once the pepper’s soft and a little wrinkled, it’s ready to eat. In the US, our cuisine is often based on separate protein, grains, and vegetables on a plate and we think it’s bare if it’s not “filled out” this way, but in much of the world, these components are mixed together to form a single main dish. Stuffed peppers is exactly that—a bundle of wholesome ingredients that together create something greater than the parts! To help Women Thrive Worldwide in their work for global women’s empowerment, join their Dollar a Day Circle. Monday morning—the last Monday of August—I started this fall’s first batch of Stonebridge tomato sauce, an act that signifies that the “putting by” part of the farm season has begun. I’ve already been drying tomatoes from the greenhouse for a couple of weeks, but the first big pot of onions, garlic, peppers, and heirloom tomatoes simmering all day on the stove means I’ll be spending the next four or six or eight weeks—depending on the first frost—putting up food for the winter and early spring. We had sauce on pasta for dinner that night and the rest went into the freezer for a snowy night when we need a quick and hearty meal. We laugh that our tomato sauce could be called “a delicious blend of vine-ripened heirloom tomatoes”—but that really means “made from whatever tomatoes were left over after Saturday’s pick-up at our CSA.” They are vine-ripened and heirloom, including rich yellow and red Brandywines, green-shouldered Cherokee Purples, pinkish Mennonites, striped Vintage Wines, hefty Amanas, heart-shaped Russian Annas, and pointy Opalka and squat Amish pastes, but they’re usually the least attractive or most compromised of the tomatoes and thus left behind, all the better for saucing. Today I’ve got another batch of paste tomatoes in the dehydrator, along with the Juliets, which are small, oval cluster tomatoes that we planted in both the greenhouse and the fields. They grow three to a cluster and are perfect sliced in half lengthwise for drying. This is our first year growing Juliets, a variety we picked to complement the cherry Peacevines in the greenhouse, and we’re impressed by their size and productivity. I depend on deep red dried tomatoes for putting by because they’re like a little piece of sunshine in the deep of winter. At a seed-saving lecture recently, we learned that while Juliets were developed as a hybrid decades ago, their seeds have been carefully selected for so many years, they’re now essentially an heirloom. That means that the big seed growers don’t have to cross-pollinate them from parent plants anymore but can save seed from the fruit instead. Of course, most seed companies don’t want you to know all that or you’d save your own seed rather than buy from them, but we do know now, so we’ll save Juliet seeds to replant next spring. Seed-saving is part of putting by at Stonebridge, where we save our favorite tomatoes and peppers in little scalloped sauce dishes all over the kitchen table, transferring them to glassine envelopes when dried. 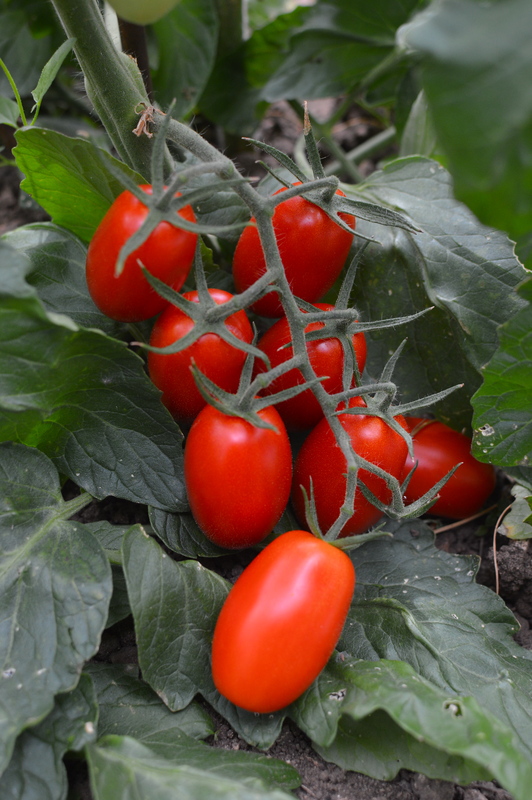 Just today a friend dropped by with an heirloom early, cold-night tolerant tomato called Precocibec that she tried for the first time this year. After I save the seed, the tomato will go in the veggie korma, an Indian dish I’m making for dinner with zucchini, onion, green beans, carrots, and potatoes from the garden. I wish I could capture in words the glorious weather we’re having here on the Front Range of Colorado right now, days in the upper 80s with just a hint of coolness in the air. We’ve had a lot of moisture this summer and some beautiful blue skies canopied with white clouds. Last night we sat with friends after our last softball game of the season and watched as the western clouds gleamed rose-pink over the mountains and one tall cloud in the east was caught in the last of the sun’s rays, glowing white longer than the darkening clouds around it. When earlier sunsets and cooler days of the receding summer remind us of the coming cold, putting by begins in earnest on the farm. This morning I spent time in our new drying hut, a gift from a friend who built it from reclaimed materials for a music camp in the Rockies as a luthier workshop. We inherited the hut–christened “Egg” after the other bird-named cabins–when the camp applied for heritage status and the satellite disk roof didn’t quite fit the building criteria for the camp’s auspicious history. This is the third of our disk-roof huts and they’re all useful—one for tools out in the field, one for wood by the house, and now this one for herbs under the shady cottonwoods by the greenhouse. We added an old multi-paned door fitted with doorknobs salvaged from my grandparent’s farmhouse. Inside we store garlic and shallots for our members in the coming months and dry herbs on a discarded window screen set across two campstools. A rewindable clothesline from the 40s stretches from side to side for hanging bunches of herbs like tarragon and rosemary. I love this little hut. Sheltered under the trees, it’s dry and clean and out of the direct sunlight that can fade herbs. It reminds me of the arched chicken coop-turned-playhouse at my grandparent’s farm where we served tea to our dolls in discarded cold cream and canning jars. This afternoon I’ll start drying herbs in the hut for our Thanksgiving share—an extra harvest of roots and squash and alliums we’re offering this year for the Thanksgiving meal and more. Thanksgiving is only 11 weeks away and we have lots of vegetables to harvest before then, but I’m happy to start thinking about the end of the season as I put by today’s sunshine in vegetables stored for the winter.